As preferred by all organizations, clubs, and just about everyone, for the safety of our dogs. Making it lighter weight, and weather resistant. Even the top surface is solid 1/8 inch thick aluminum, which is much stronger than foam cored aluminum panels. There are no fasteners, everything is professionally welded. This thing is built strong! It has NO twist, whip, or oil can effect (surface will not ‘give’ or feel spongy when weight is applied). The preferred contact obstacle surface for comfort, speed, safety, and traction. This is a professionally applied, minimal thickness (to reduce weight), balance blended rubber surface that will last a decade. Skin is made from TPV rubber granules from American Recycling, the best quality virgin polymer. It has a dust free, uniform granule size, that is UV resistant. The binder has been specially developed by Dow Chemical. Hose it off, power wash it, leave it outside in the elements… it can handle it! Plus, it looks beautifully amazing. No sloppy job here… it has no bleed through of glue, a consistent thickness of rubber, and a blend of rubber and binder throughout that makes for a much more comfortable surface for your dogs paws, without ever shedding. It is able to handle the rigorous activity of kennels, shelters, training centers, and competitions. Dimensions are 12 feet long x 12 inches wide, with 42 inch yellow contact zones on each end, and royal blue center. Predrilled pivot point is slightly off center, to allow the teeter to reset itself. Important: This is the plank only. To complete the teeter, you will need a base. 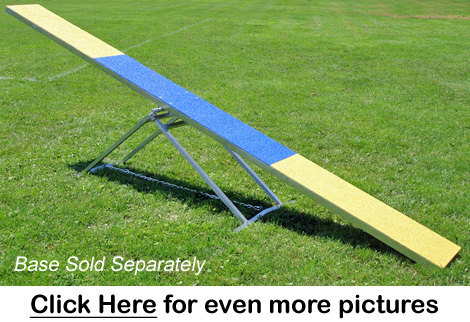 You can buy our Adjustable Aluminum Seesaw Base separately. Ship Note: This must ship by freight truck. If you place an order using the shopping cart, the shipping charge will not show. Instead, we will call and email you after you place the order to give you the quote and talk about details. We will get your permission before charging your credit card. Ship Note: This can ship via regular UPS.